« How was Krishna Sen killed ? IN THE DHAULI FOREST, India (AP) – After the paved roads have ended and the dirt roads have crumbled into winding footpaths, after the last power line has vanished into the forest behind you, a tall, red monument suddenly appears at the edge of a clearing. The monument is a memorial but also a signpost, a warning that you are entering a “Liberated Zone” _ a place where Mao is alive and Marx is revered, where an army of leftist guerrillas known as the Naxalites control a shadow state amid the dense forests, isolated villages and shattering poverty of central India. Here, the Indian government is just a distant, hated idea. Initially formed in 1967, the Maoist army has taken root over the past decade in places left behind during India’s spectacular financial rise since its economy was opened up in the early 1990s. Outsiders rarely see their strongholds, but a team from The Associated Press was invited last month into a region they control. As India has grown wealthier, the Naxalites _ officially called the Communist Party of India (Maoist) _ have grown larger, feeding off the anger of the country’s poor. There are now 10,000-15,000 fighters in an archipelago of rebel territory scattered across nearly half of the country’s 28 states, security officials say. Over the past two years, nearly 2,000 people _ police, militants and civilians caught in the middle _ have been killed in Naxalite violence. In March, 55 policemen and government-backed militiamen were killed when up to 500 Naxalites descended on an isolated Chhattisgarh police station. The rebel patchwork reaches from deep inside India to the border with Nepal, where the Naxalites are thought to have informal ties to the Maoists who, after a long insurgency, recently joined in the Katmandu government. The Maoist goal in India is nothing less than complete takeover. “There is only one solution to India’s problems: Naxalism,” said Ramu. The movement takes its name from Naxalbari, a village outside Calcutta where the revolt began in 1967. 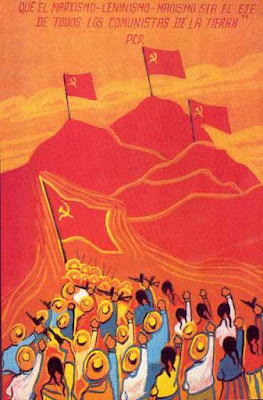 Inspired by Mao Zedong, founding father of the Chinese communist regime, they believe an army of peasants can one day overthrow the government. The Naxals are strongest in states such as Chhattisgarh that have large populations of “tribals,” the indigenous people at the bottom of India’s rigid social order. More than ever, their once-marginal revolt seems like outright war, particularly in the rebel strongholds of rural Chhattisgarh. India deals with other insurgencies, from Kashmiri separatists to a spectrum of ethnic militant groups in its remote northeast. But the Naxalites have proven different. They have support not just among the poorest or a single ethnic group, and have survived for forty years. In places like the Dhauli forest, a tangle of vegetation unmarked on most maps _ 500 miles from Bangalore, 450 miles from Calcutta and 600 miles from New Delhi _ the Naxalites are more than surviving. They are winning. Here, government officials hold little power. Through much of the countryside, nervous policemen barricade themselves at night inside stations ringed by barbed wire. Politicians dismiss the Naxalites as criminals, but those politicians go nowhere without armies of bodyguards. Victory, the Naxals insist, is coming. Most of the Naxalites’ guns are old or handmade. Their land mines are often made from pressure cookers, and bullets are doled out carefully. Their support in many villages has more to do with fear than genuine belief. Their control can be fleeting. If security forces move into a Naxalite-run area, the fighters simply disappear into the forests. But while there’s little chance they’ll overthrow the government, in this part of India their power is immense. Every day or so, another policeman is killed. Every few months, another politician faces an assassination attempt _ sometimes successful, sometimes not. Inside their self-proclaimed Liberated Zones, the Naxals are, effectively, the government. They collect taxes, control movement, and trade in valuable hardwoods from the ever-thinning jungles. They refuse entry not only to the government but also aid organizations, arguing they are tools of an unjust state. There is an informal Naxal bank, Naxal schools and Naxal courts to settle village disputes and try suspected informants. For those found guilty of helping police, the punishment is public beheading. Outside, a thunderstorm shook the sky, and rain pelted the straw roof. Inside, a half-dozen fighters sat in the darkness of the mud house, listening silently as Ramu spoke. One carried an AK-47 assault rifle, but the rest were armed with ancient British-made Enfield rifles, some dating to the 1940s, or homemade single-shot shotguns and rifles. For now, until paradise comes, people live in mud homes on tiny farms. They grow rice and tobacco and harvest what they can from the forests. Better-off families have $12 shortwave radios or $45 Atlas bicycles. In a village on the fringes of Naxalite territory, a teenager named Meetu Ram _ he thinks he’s about 17 _ talked about his life one recent evening. His family, by local standards, does well: They have a well-kept compound with three one-room buildings and a half-dozen cows. Still, Ram has never been to a doctor, and has not even heard of telephones. Asked to name India’s prime minister, he shrugged. It is in places like this where the Naxalites’ appeal is most resonant. India may have one of the world’s fastest-growing economies, but it also has vast _ and often growing _ rural poverty. In Chhattisgarh, that has been magnified by conflicts over everything from forest conservation to mining rights, with tribals often expelled from their jungle homes. Much of Ramu’s time is spent spreading the rebel message. On a recent afternoon, he summoned hundreds of villagers to a rally to decry the Salwa Judum. While leaders of the government-supported Salwa Judum insist they are protecting villagers from Naxalite violence _ they have gathered some 50,000 tribals into dingy, guarded camps _ rights groups accuse them of widespread abuses. Many, though, don’t see heroes on either side. Sanjana Bhaskar, 18, has spent more than a year in a Salwa Judum camp. This entry was posted on June 18, 2007 at 5:54 pm and is filed under Articles, Chhattisgarh. You can follow any responses to this entry through the RSS 2.0 feed. You can leave a response, or trackback from your own site. interesting, it seems like there is a real contradiction between the number of Naxalite Freedom Fighters and the number of weapons the People’s Army has to fight its People’s War. How do you think this contradiction can be overcome?